English pugilist; born 1763 in White-chapel, London; died Sept. 3, 1836. Champion of England from 1792 to 1795, he was the founder of a distinct school of boxing which marks a period in the history of pugilism. 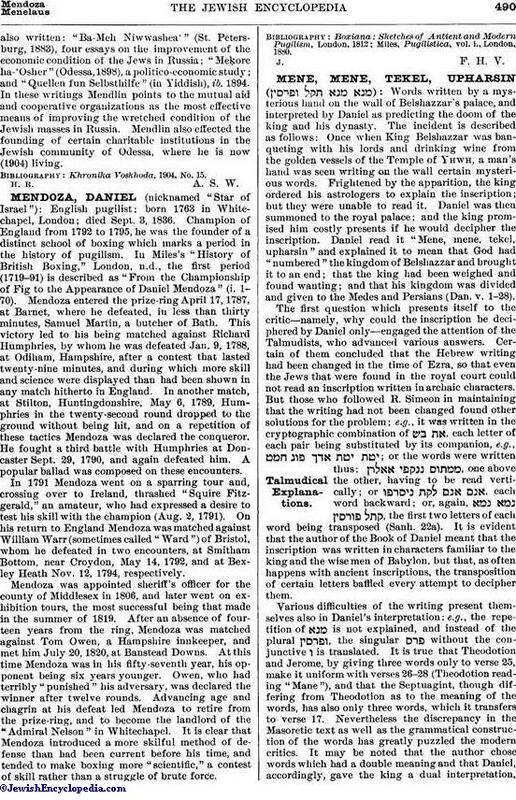 In Miles's "History of British Boxing," London, n.d., the first period (1719-91) is described as "From the Championship of Fig to the Appearance of Daniel Mendoza" (i. 1-70). Mendoza entered the prize-ring April 17, 1787, at Barnet, where he defeated, in less than thirty minutes, Samuel Martin, a butcher of Bath. This victory led to his being matched against Richard Humphries, by whom he was defeated Jan. 9, 1788, at Odiham, Hampshire, after a contest that lasted twenty-nine minutes, and during which more skill and science were displayed than had been shown in any match hitherto in England. In another match, at Stilton, Huntingdonshire, May 6, 1789, Humphries in the twenty-second round dropped to the ground without being hit, and on a repetition of these tactics Mendoza was declared the conqueror. He fought a third battle with Humphries at Doncaster Sept. 29, 1790, and again defeated him. A popular ballad was composed on these encounters. In 1791 Mendoza went on a sparring tour and, crossing over to Ireland, thrashed "Squire Fitzgerald," an amateur, who had expressed a desire to test his skill with the champion (Aug. 2, 1791). On his return to England Mendoza was matched against William Warr (sometimes called "Ward") of Bristol, whom he defeated in two encounters, at Smitham Bottom, near Croydon, May 14, 1792, and at Bexley Heath Nov. 12, 1794, respectively. Mendoza was appointed sheriff's officer for the county of Middlesex in 1806, and later went on exhibition tours, the most successful being that made in the summer of 1819. After an absence of fourteen years from the ring, Mendoza was matched against Tom Owen, a Hampshire innkeeper, and met him July 20, 1820, at Banstead Downs. At this time Mendoza was in his fifty-seventh year, his opponent being six years younger. Owen, who had terribly "punished" his adversary, was declared the winner after twelve rounds. Advancing age and chagrin at his defeat led Mendoza to retire from the prize-ring, and to become the landlord of the "Admiral Nelson" in Whitechapel. It is clear that Mendoza introduced a more skilful method of defense than had been current before his time, and tended to make boxing more "scientific," a contest of skill rather than a struggle of brute force. Miles, Pugilistica, vol. i., London, 1880.